I wanted to make some new accessories yesterday. For this cuff, I used a long lace applique that I'd had for a few years. I added some jump rings and a lobster clasp to make it wearable. 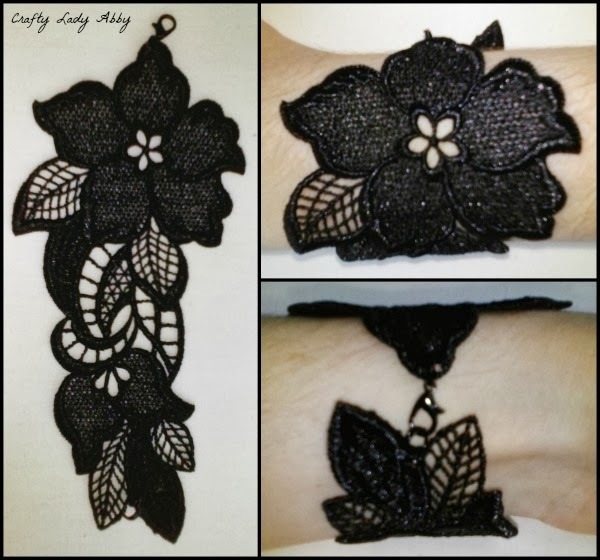 This can be done with many colors and styles of lace appliques. Avoid the adhesive kind, as it won't flex well enough for this project. If you wanted to embellish it, you could sew on beads and sequins, glue on crystals and plastic gems, or glue glitter onto it. I liked it without any sparkle. I bought this applique on Etsy. This took me about 10 minutes to make. This is great for jewelry making beginners and people who like quick results! 1) I wrapped the applique around my wrist and noticed a small leaf caused an overlap of the ends. I used the small scissors to cut around the edges of the leaf where it connected with the rest of the applique. If you are worried about fraying or unraveling , you can use a little Fray Check at the cut area of the applique. 2) Using the pliers, carefully attach one of the split rings through one end of the applique. I attached mine to the V of the leaves over the binding of the solid leaf. 3) Using the pliers, carefully attach one of the split rings through the hole of the previous jump ring. This will make a chain of two rings. 4) Add the lobster clasp to the last split ring. You might be able to separate the ring a bit so it's open enough to slip the clasp on. 5) Using the pliers, carefully attach the last split ring to the other end of the applique. Mine had a point from a flower petal. I attached it over the binding at the point. If the ring is still parted a bit from adding the lobster clasp, you can smush it closed again with the pliers.